Michael McFadyen's Scuba Diving - SS New Guinea The SS New Guinea is a fascinating shipwreck, one of the most enjoyable of the many New South Wales shipwrecks that I have dived. The New Guinea was constructed at the Sunderland, England dockyards of W. Doxford and Sons and launched on 7 October 1884. The ship was yard number 160, official number 89634. It was an iron hulled single screw steamship of 2,674 tons, length 300 feet and width 40 feet. Powered by a coal fed boiler and a 260hp Simplex compound engine manufactured by Doxford, the ship was built for McIlwraith, McEacharn and Company of Melbourne. She also had two masts and sails. The new ship was said to be a collier but it seems to me that perhaps she was a general cargo vessel at first, carrying passengers. I have this view as the first runs were from London to Australia and it is very unlikely that a collier would be doing this. Perhaps she was converted later. On 13 October 1894 it was reported in The West Australian that in the Fremantle Local Court J. Pattison and Company sued McIlwraith, McEachern and Company, owners of the ship, for £12 19s 4d for 11 bales of chaff that were short delivered from the June-July trip from Melbourne to Fremantle. Pattison ordered 46 bales from Robertson and Company in Melbourne. All were said to be distinctly marked with a brand. Only 35 of the branded bales were delivered to the railway authority at Fremantle. However, 11 bales without branding were delivered. Mr R. Fairbairn, RM, found in favour of McIlwraith, McEachern and Company as a total of 46 bales were delivered. In March/April 1897 the New Guinea made a run from Fremantle (Perth) up the coast of Western Australia. The ship appears to have had an uneventful life until 1911 although she had a new prop shaft fitted in 1910. Still owned by McIlwraith, McEacharn and Company, the New Guinea was under charter to Huddart, Parker and Company Ltd and carrying general cargo when on 13 February 1911 the ship ran into dense fog near Green Cape, about 26 kilometres to the south of Eden and just north of the New South Wales/Victoria border. Green Cape is at the end of a narrow peninsula that juts out from the coast to the south and in 1883 a 29 metre high lighthouse was constructed there. The light was 44 metres above sea level and the light could be seen 18 kilometres away. The ship was on a trip from Melbourne to Sydney and under the command of Captain Coleman. However, at 11.50 am on 13 February 1911, the light was not much help to the New Guinea when it ran aground exactly 1.25 kilometres to the west of the lighthouse. The engines were ordered to be reversed but it was too late, the ship was doomed. The engine room and bow filled with water very quickly and the 28 crew abandoned ship. As this is a very rugged coastline and no persons living nearby except for the lighthouse keepers (now no longer living there), the crew set off in two (or more?) lifeboats for Eden. One was taken 15 kilometres out to sea by the wind and currents before making it back to the Green Cape area. Another had trouble and turned back when she approached Green Cape and went back to the wreck. I think the remaining boat made it to Eden. 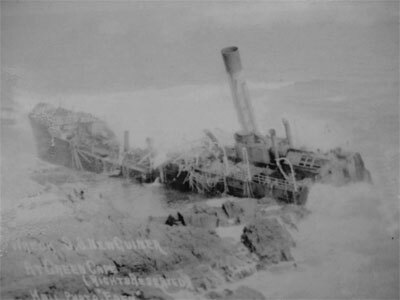 Three vessels were sent to the wreck, the Fenwick and Company tug Heroic and a motor vessel S.E.A. and a launch Excelsior, both sent by the Eden pilot. Finally the crew were found and towed back to Eden by the S.E.A.. Even then, the action was not over as one vessel was cut adrift and the other put into Bittangabee, a few kilometres north of Green Cape. Finally, the crew arrived in Eden at 9.30 pm on 13 February 1911. Within two days it was reported that the New Guinea had broken up. 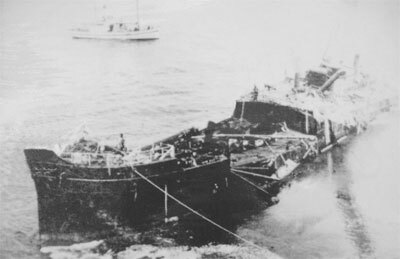 The stern section appears to have sunk and the bow stranded on the shore. There is a photograph of the bow high and dry. The ship and cargo was said to be valued at £20,000 and that there was valuable machinery being carried as deck cargo (more about this later). It was also reported that the ship and cargo was to be auctioned on 20 February 1911 and that a Marine Court of Inquiry was to be held in Sydney. It is not clear if the ship and cargo were sold. The Sydney Marine Court of Inquiry decided that Captain Coleman was at fault for being too close to the shore and sailing a full speed in thick fog. His licence was suspended for six months. In the 1960s, Carlo Filippetti (later owner of Gosford Diving Services at Umina on the NSW Central Coast), headed a salvage team that visited the New Guinea and carried out some salvage work, using explosives. It is not known what things were taken. It was also reported to me by Barry Andrewartha, Editor and Publisher of DIVE Log Australasia, that the wreck was also "ratted" by many people in the 1960s, including former Sydney diver Barry May. Today the wreck lies in less than 10 metres of water. Accordingly, the New Guinea can only be dived in extremely calm seas. Luckily, the wreck site is protected from some winds, especially north-easterly and easterly winds. However, due to the distance from Eden (about 28 kilometres to the wreck), the local charter operators do not generally dive this and the nearby wrecks and it is a long way to run down in anything but very calm seas. Therefore it is likely that you will need to use a private boat. If you have a smallish boat (say under five metres), the best bet is to run out of the small coastal village of Womboyn. This requires a lot of planning as the lake, river and bar are very shallow and you can only travel to the sea from the boat ramp in the period about two hours either side of high tide. Therefore you need a high tide of about 1.8 metres, occurring about 9 am to 12 am enabling you to exit the bar at 7 am to 10 am. Also, you need calm seas, no swell at all from the south but even very strong north-easterly winds and seas should be okay. The actual wreck site is quite easy to find. The GPS Reading for the site is approximately 37º 15' 37"S 150º 02' 16"E (using AUS66 as datum - if you use another, see my GPS Page). On the cliff face to the north you will see that the rock layers are not horizontal but saucer-like or concave. The end bits of the concave rocks run down into the sea as ridges. In addition, on the shore you will see many pieces of wreckage, including an anchor on the inside of the ridge to the west. There is also a small bombora to the east and you will be in a direct line from the lighthouse to the east and a prominent cave to the west. Anchor on the top of the western ridge. The depth of the wreck is less than 10 metres and the majority of the wreck is between the two ridges. The main features in this area include the keel and large sections of the hull still intact, with plating and supports everywhere. There are also some other interesting things, including two huge detachable propeller blades. These are not from the ship, but were being carried as cargo. They are placed in such a manner that the blades appear to be joined together, especially as they have bolts and nuts through the holes in the bases. However, if they are, it is only for ease of storage. Near here there are dozens of lead ingots. Each of them is about 150 by 150 by 20 mm with a round hole in the middle. I have been unable to ascertain whether they served any purpose on the ship or were just part of the cargo. There is a small strange object here. This looks like a rectangle cage but is definitely part of the ship. There are also some pieces of the remains of the boiler all over this area. Very close to the two blades is the start of the propeller shaft. This is partly hidden by kelp and runs in a westerly direction over the next ridge. Once you cross the ridge there are another three detachable prop blades, each identical to the previously mentioned ones except that they do not have bolts and nuts. There is another smaller section of prop shaft that runs further west across the gully. At the end of this there is a large bearing and on the rocks below, a small broken section of shaft. There are more broken sections nearby. A bit further to the west is the ship's prop. It is a four-bladed prop with a smallish hub. The blades are all broken off, with only the stubs remaining. I am not sure if the blades were broken off by the salvage attempts, but the appearance is consistent with the report that the engine of the New Guinea was placed in reverse once the ship ran aground and once the ship took on a bit of water, the prop hit the shallow reef and the blades broke off as the engine still turned over. To the south of the ship's prop is a very interesting item. On page 37 of Shipwrecks of Twofold Bay/Disaster Bay by Tim Smith, NSW Heritage Office, this is alleged to be the prop of the New Guinea. However, I do not believe this is true. This prop consists of a large hub, with two detachable blades bolted to it. These blades are identical to the other five blades on the wreck. In the place where the other two blades should be, there are only bolts and nuts. This, together with the fact that there are five other blades, none of which are damaged, leads me to think that the hub and two blades is an item of cargo, being carried like this to simplify storage and for ease of movement. Near here I thought that I saw the engine, or at least the remains of the engine. It looked to me like broken sections of the compound engine, the cracked cylinder heads. However, I have since read that the engine is located to the east, on the side of the bombora. I will have to check this out on my next visit. Along this gully towards the shore there are more interesting items, including winches, pulleys and in about five metres, two large double bollards. Back to the east from here, and in the shallow section of the main gully, there are many pieces of wreckage. The main thing I found was the other anchor (remember the other is on the shore). However, it is very difficult to find items here as the whole area is covered in a dense layer of kelp and there are many boulders for the wreckage to be hidden under. 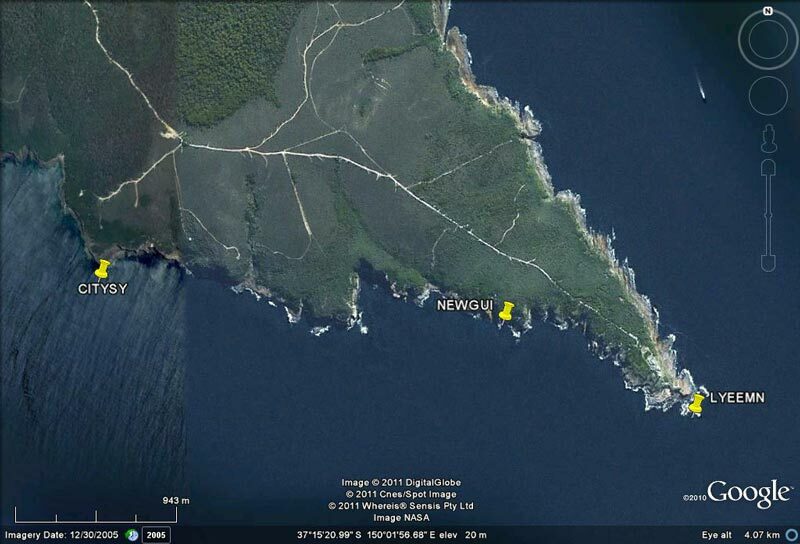 In summary, this is an excellent shipwreck, one of the most interesting I have ever dived in New South Wales. If you get a chance, dive it as many times as you can. The only way to dive this location (unless you have your own boat) is by Merimbula Divers Lodge who can provide accommodation as well as boat services. I can really recommend their attention to all your needs. They have indicated to me that they will organise dives to the Green Cape area for groups, but it would depend heavily on weather conditions and time of year (eg outside peak periods).